Eagle Vision has set Black Sabbath – The End for multi-format release on November 17th. The concert captures the final destination of the 50 year old group’s final tour with an unforgettable farewell show at the Genting Arena in Black Sabbath’s hometown of Birmingham. Filmed February 4, 2017, The End captures the legendary line-up celebrating their storied career, marking the closure of a monumental chapter in rock history. Following last month’s world premiere of a companion documentary film in over 1,700 cinemas around the world, Eagle Vision brings the concert to the fans via DVD/CD, Blu-ray/CD, double CD, triple 180-gram vinyl and a limited deluxe collector’s edition. A limited number of exclusive merchandise bundles are also available at PledgeMusic. 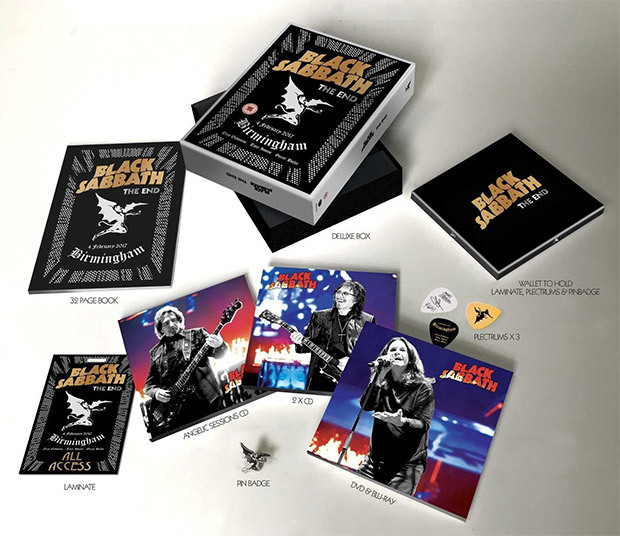 The limited deluxe edition includes the concert on Blu-ray, DVD and double CD; The Angelic Sessions on CD; 32 page perfect bound book on heavyweight stock; metal Winged Demon pin badge; replica The End tour laminate; and three Plectrums all housed in a DVD-height two piece rigid mirror board box. With a hit packed set list including “Iron Man,” “Paranoid,” “War Pigs” and many more, the high production values, visual effects and pyrotechnics wowed fans, as the band delivered the most emotionally charged show of their lives. “Because it was Birmingham, it was a special night for us,” states guitarist Tony Iommi. “It was great to look out and know that all these people have come to see us. What a great feeling. There’s nothing like it”. All visual formats feature special bonus material of the band playing a selection of their favorite songs not played on tour. These intimate live sessions at Angelic Studios were recorded in the days after their final live performance, and mark the band’s final studio recordings. Bassist Geezer Butler states, “It will never be The End for me. I’ll always be a part of Sabbath, and Sabbath will always be a part of me”.